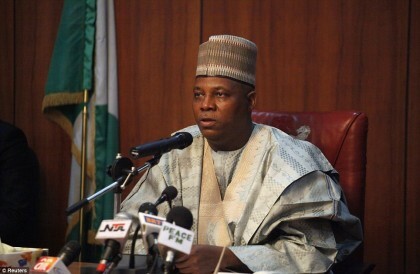 Isa Gusau, Maiduguri: Following resurgence of attacks by remnants of the ‎Boko Haram insurgents in some parts of Borno State, Governor Kashim Shettima on Friday evening held an emergency security meeting that was attended by heads of Heads of the Nigerian Army, Air Force, Police and the Department of State Security with proactive measures taken on how to increase surveillance and forestall unanticipated security breach. During the meeting, the Governor was briefed over recent attacks and ongoing military operations while discussions were held with assurances that the remnants of the insurgents were on suicidal mission given their displacement from their former headquarters at the Sambisa forest. Special Adviser on Communications and Strategy, Malam Isa Gusau said in a statement emailed to journalists on Sunday, that after meeting with the Theater Commander who is not a member of the State Security Council, Governor Shettima presided over an emergency meeting of the State security Council that involved core armed forces. Held for over three hours at the council chambers of the Government House, the meeting had in attendance ‎the G.O.C, Seven Division of the Army, Brigadier General Victor Ezugwu, the Commander, 79 Composite group of the Nigerian Air Force, Air Commodore Charles Oho; the Borno State Commissioner of Police, CPo Damien Chukwu, the Garrison Commander, 7 Division of the Army, Brigadier General Jibrin G. Mohammed, the State Director of the DSS, Suleiman Kankia; Commandant of the Nigerian Civil Defense Corps, Ibrahim Abdullahi, the Secretary to the State Government, Usman Jidda Shuwa, the attorney General and Commissioner of Justice, Barrister Kaka Shehu Lawan and the Permanent Secretary in charge of security. At the end of meeting, new guard locations were established in some routes across the State to curtail the movement of remnants of Boko Haram fighters; deployment of security personnel to various locations were increased with more members of Civilian JTF (youth volunteers involved) while the Governor gave approval for release of additional patrol vehicles to security agencies for increased surveillance. The Governor also approved logistics to compliment efforts of the federal government in strengthening armed forces while measures were adopted to strengthen the Civilian JTF and hunters. The meeting also reviewed synergy between formal armed forces and volunteers with steps adopted to increase collaboration and clamp down on cattle rustling used by insurgents to raise funds. The council deliberated on recent false information spread by mischief makers to cause disaffection between armed forces and volunteers particularly the Civilian JTF with the council warning mischief makers against destabilizing the emerging peace across the State. ‎Mr Gusau, media aide to the Governor said the measures adopted at the meeting were already being implemented at the weekend.